A new study of upzoning in Chicago, published in the journal Urban Affairs Review, finds that the changes led to higher home prices, and no noticeable impact on local housing stock. In an email conversation, Freemark tells co-founder and editor-at-large of CityLab Richard Florida, "even if upzoning—in the medium or longer term—increases the number of housing units (though I do not find evidence for or against this in my study), we still have to contend with the potential that the short-term impacts of the change are higher home prices and likely higher rents for those directly affected by the change, especially since new development, as everyone knows, takes many years to get underway. The speculation will come first." Freemark has analyzed the effects of upzonings in Chicago neighborhoods. 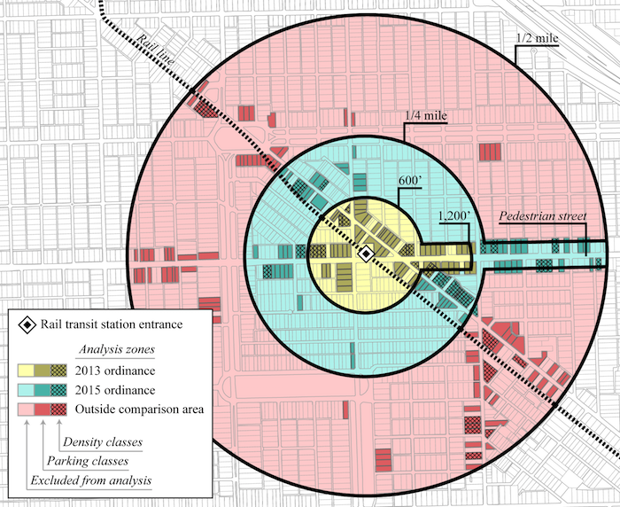 His study takes the form of a natural experiment (the “gold standard” of social-science research) by comparing an initial set of zoning reforms, undertaken in 2013 to encourage development around transit stops, with a more aggressive set of reforms from 2015, which expanded the upzoned areas and increased incentives for taller, denser development.